NEWPORT NEWS, Va., Jan. 9, 2006 (PRIMEZONE) -- Northrop Grumman Corporation (NYSE:NOC) was awarded a contract for dry-dock and maintenance work on the cruise ship Carnival Glory. Northrop Grumman's Newport News sector is the prime contractor for the work, which is expected to take 10 days to perform and will include hull structure maintenance, underwater hull equipment inspections and underwater hull painting. The contract is valued at approximately $1.2 million. "This is another opportunity to demonstrate how we can be responsive to a variety of customers," said Irwin F. Edenzon, vice president of technology development and fleet support at Northrop Grumman Newport News. "While the majority of our fleet support work is for the Navy, we are committed to providing high-quality, cost-effective repair and maintenance services to the commercial market as well. 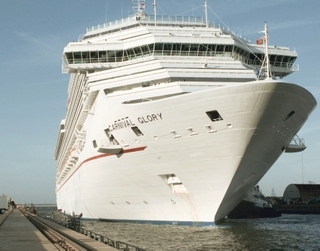 We have worked closely with Carnival to plan this job and get the Glory back to work. We appreciate their business." Carnival Glory arrived at the shipyard on Jan. 9. The 110,000-ton ship is owned and operated by Carnival Cruise Lines and can carry 2,974 passengers. Approximately 40 Northrop Grumman Newport News employees will work on the project.